A fabulous display of blossom. Perfect for small gardens. Pretty compact tree will burst into flower before the leaves appear in Spring each year. Red buds open to reveal the beautiful spring blossom. Perfect for small gardens or for growing in a pot on your patio, providing year round interest. Fully winter hardy and grow to just 3 ft in 10 years if left unpruned. Supplied as mature bush 30-40cm tall in 2 litre pot. 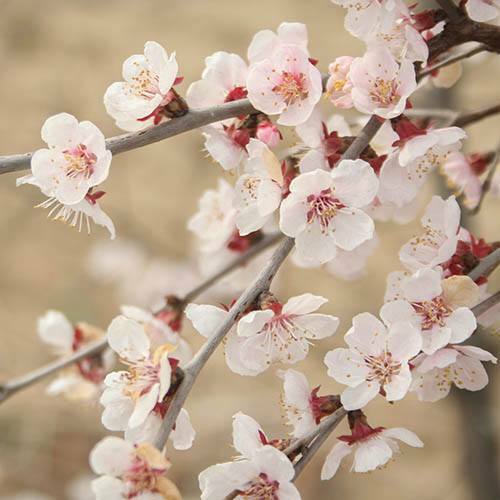 Also known as the Fuji Cherry, this gorgeous, compact tree will burst into flower before the leaves appear in late winter / early spring each year. Kojo-No-Mai is fully winter hardy whatever the weather and grows to just 3ft after 10 years if left un-pruned, but will be happy to receive a regular trim during early summer after flowering has finished.